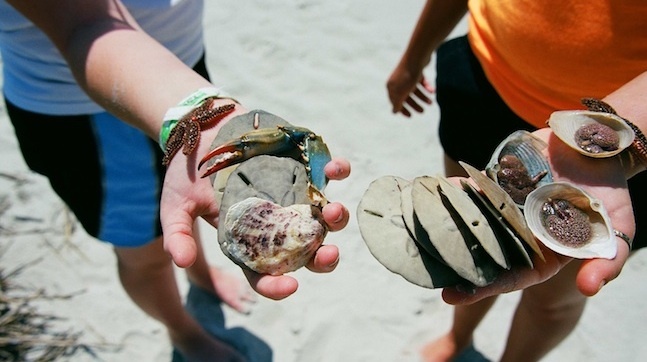 Clark Alexander and his team are working on a project to predict how the Georgia coast—characterized by a complex system of barrier islands, salt marshes, estuaries, tidal creeks and rivers—may look 25, 50 and 100 years from now. As sea level rises over the next century, that picture is changing. Predictions of sea level rise over the next century vary from the current rate of roughly 30 centimeters—about a foot—to as much as two meters—about 6 feet. Although scientists disagree on the ultimate height of the rise, they all agree that salty water is moving inland and will continue to do so for the foreseeable future, Alexander said. Here on the Georgia coast, islands will become smaller or disappear entirely; salt marshes will be inundated by the rising waters and migrate towards the uplands; and some low-lying uplands will become salt marshes. To predict the extent of these changes, scientists are using the predictive Sea Level Affecting Marshes Model, or SLAMM, which was originally developed for the U.S. Fish and Wildlife Service. SLAMM predicts the effects of future sea level rise based on two key inputs: an elevation mapping of the coastal zone and salinity profiles up the rivers and waterways. Salinity and elevation are two key factors that determine the type of plants, and thus habitat, that will be present at any particular location. 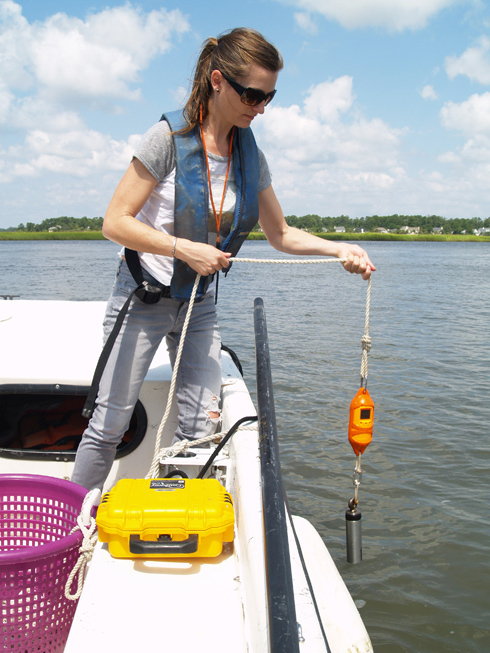 LeeAnn DeLeo lowers a conductivity-temperature-depth sensor through the water column. Funded by a Coastal Incentive Grant from the Georgia Department of Natural Resources Coastal Management Program, Alexander and his team have been studying the five key river systems along the coast and numerous salt marsh estuaries. Salinity along the coast is dominantly affected by river discharge into the estuaries, so the team has been conducting its surveys during both winter—high river flow—and the summer—low river flow—conditions. 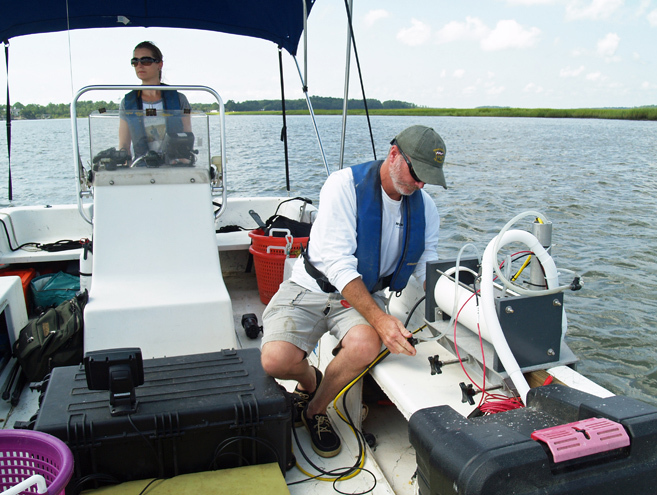 In addition to tracking surface salinity, the researchers also stop periodically and measure the salinity throughout the water column to determine if what they measure at the surface is similar to what is present near the bottom. They lower a device that measures the water conductivity (which is related to salinity), temperature and depth from the surface to the bottom. Also equipped with GPS capability, the device automatically captures the location of every water column profile. Mike Robinson adjusts the monitoring system while LeeAnn DeLeo drives the boat. In many coastal regions, denser, saltier water tends to sink to the bottom and the lighter, fresh water remains near the surface. However, because of the energy produced by Georgia’s wide tidal range, the team found that most of the water on the Georgia coast is well mixed and doesn’t show up as layers. The second part of the project is to fine-tune existing elevation data. Scientists have an extensive set of elevation information from airplane-mounted Light Detection And Ranging systems. LIDAR is usually very accurate, except in marshes, because it cannot see through the vegetation to the actual ground surface. “You might be off by 30 centimeters or more, and in a low-lying, flat area like our coastal zone, that can make a big difference in predicting where the water will flood,” Alexander said. The Skidaway Institute team is working with Georgia Southern University scientist Christine Hladik on a fix. By comparing LIDAR data with the true elevation in a particular area, Hladik observed that the LIDAR error varied according to the type of plants growing there. For example, if the area contained the dense, tall spartina, the error was large and, on average, a consistent number of centimeters. If the region was covered with a different, less-dense-growing salt marsh plant, like short spartina, the error was smaller but also consistent. “She discovered that if you know what type of vegetation is covering a section of marshland, you can plug in the correction and come back with an accurate measure of the elevation,” Alexander said. The research team observed the vegetation and measured the true ground level at 400 randomly selected points throughout coastal brackish and salt marshes in Georgia. That information and knowledge of plant types is being used to correct the existing marsh elevations. The research team will complete one more set of river surveys before the project ends in September. 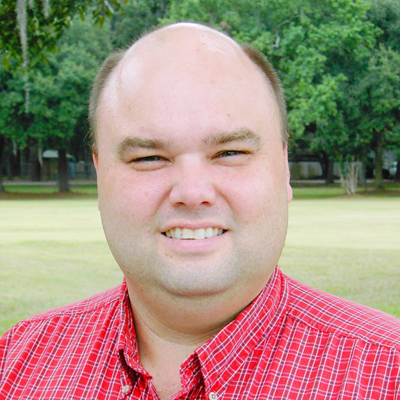 Alexander hopes to obtain continued funding to use this newly acquired elevation and salinity data in a fresh SLAMM model run for the Georgia coast, using all the high-resolution data developed in this project. Visitors to the UGA Aquarium will experience a new exhibit focusing on extinct Atlantic gray whales. This exhibit is the product of a collaboration among among the aquarium, Scott Noakes of the UGA Center for Applied Isotope Studies, Gray’s Reef National Marine Sanctuary, Emory University, the Smithsonian National Museum of Natural History and the Scientific Illustration group at UGA’s Lamar Dodd School of Art and Design. 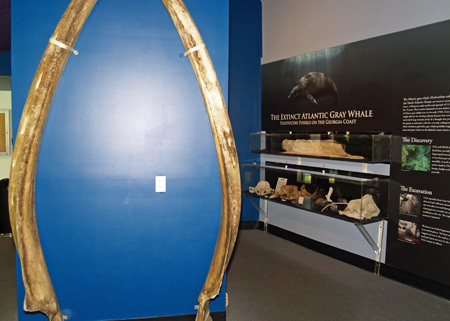 The exhibit features information about the fossilized remains of extinct Atlantic gray whales that were discovered off the Georgia coast as well as a painted cast of one of the fossils (mandible, or lower jaw bone).